This past week, the men’s lacrosse team split a pair of NESCAC matchups with a stunning overtime loss to Amherst, before bouncing back with a win over Williams. Both Little Three rivals proved to be quality opponents as the two games were decided by a total of three goals. After last week’s action, the squad’s record sits at 7-3, with a 3-3 record in NESCAC play. With only four games left until postseason play, the Cards are in sixth place in the conference standings. Defenseman Quinn Mendelson ’17, who is a key component of a stingy Cardinal defense this year, discussed what lies ahead for the team. Last Tuesday, the team welcomed number seven Amherst to Citrin Field for an evening affair with its long-standing rivalry on the line. Despite a valiant effort by the team, led by a six-goal outburst from standout Harry Stanton ’18, the game did not end how the Cardinals would’ve liked. The 18-17 loss marked the Redbirds’ third in overtime of the season. Wesleyan led for the majority of the game and held a 13-10 lead entering the fourth quarter. However, a late Amherst rally, capped by a game-tying goal with just :02 to play, ensured the game would not end in regulation. Quentin DellaFera ’16 racked up five points in the game, composed of two goals and three assists, in addition to picking up five ground balls. The trio of Niall Devaney ’16, Taylor Ghesquiere ’18, and Carter Hawthorne ’19 added to their point totals by contributing two goals each. Ben Shively ’18 chipped in a goal along with a team-high eight ground balls, showing the grittiness that every coach surely seeks out in their players. Ted Bergman ’17 churned out an outstanding effort in net, stopping 16 shots on the evening. Wesleyan opened the scoring in the game, netting the first two goals of the night just over four minutes into the game. Amherst cut the deficit to one at the 9:55 mark, before DellaFera beat Amherst goalkeeper Cody Tranbarger to regain a two-goal advantage. DellaFera then set up a Stanton goal on a man-up opportunity to take a 4-1 lead with 4:03 left in the first quarter. When Amherst scored two minutes later, Ryan Lynch ’18 won the ensuing face-off and beat the Amherst defense to find the back of the net himself. A mere 23 seconds later, Lynch would dish a pass off to set up a goal by Shively and take a 6-2 advantage. Amherst was able to narrow the deficit to 7-5 during the first half of the second quarter, but Hawthorne quickly responded by finding Stanton to give Wesleyan an 8-5 lead. However, the Cardinals would be held scoreless for the remainder of the half, while Amherst would score three times, sending the teams into halftime deadlocked at 8-8. The Redbirds came out of the locker room firing on all cylinders, scoring three straight goals and keeping Amherst off the board until the 4:44 mark, when Charlie Gill cut the deficit to two. Stanton and Hawthorne would add two more goals, before an Amherst goal decreased the Cardinal lead to 13-10 entering the fourth quarter. Devaney, Jason Gibson ’17, and Hawthorne then ripped off three consecutive goals for the Cardinals and extended the team’s lead to a seemingly insurmountable 16-10. However, starting at the 7:34 mark, things began to unravel for the home team. An Amherst goal on a man-up opportunity, followed by a score off the ensuing face-off cut the lead to four in just eight seconds. Two more Amherst goals soon followed before Stanton ended the run with goal number 17 for Wesleyan at the 5:33 mark. Amherst would answer Stanton’s goal with a tally at the 3:20 mark, and they added another to cut the deficit to just one on a man-advantage with 1:07 on the clock. With mere seconds remaining, Tranbarger intercepted a deep pass from Bergman, and Amherst moved the ball down the field to beat the Wesleyan netminder with just :02 remaining on the clock. In overtime, the Cardinals gained possession on the face-off, but quickly turned the ball over. Amherst held on to the ball until Dylan Park beat Bergman for the game winner with 3:05 remaining on the clock. The game was a heartbreaker for the team, as they led for 59:58 of the game. All three of the team’s losses have come in overtime, with two being to nationally ranked Middlebury and Amherst. While they have suffered tough defeats, the Cardinals have certainly showed that this year’s team can play with anyone. Mendelson reflected upon this. 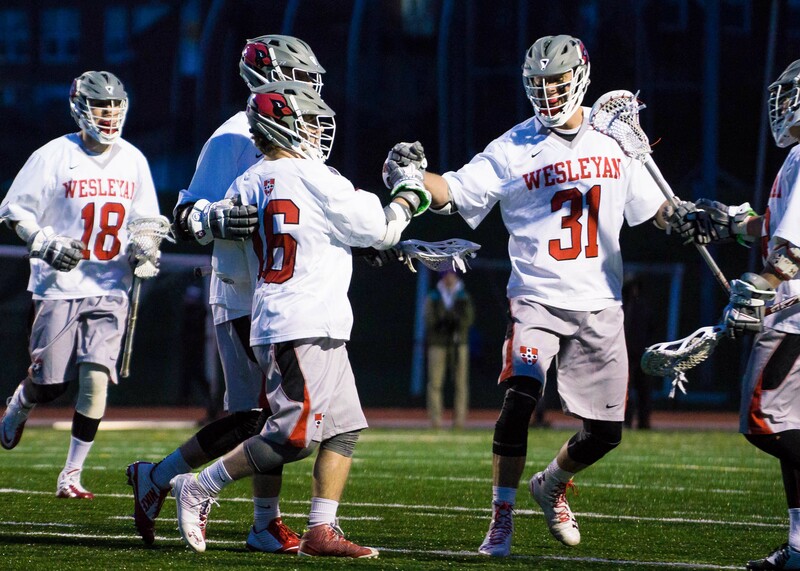 Looking for a resilient win on Saturday, Wesleyan traveled to Williamstown, Mass. to take on its other Little Three rival, Williams. The team once again got on the board first and held on through the end of regulation to pick up a 19-17 victory. In a tightly fought contest from the start, Stanton unsurprisingly led the way for the Cardinals offensively, finding the back of the net five times in addition to two assists. Stanton currently sits tied for first place in the NESCAC in goals, with a remarkable 33 in 10 games. He also sits in a tie for fourth place in the conference in total points, with 40. Christian Barker ’19 dished out three helpers on the day, while Bergman continued to impress in net, making 14 stops in the win. In his first season of regular action, Bergman currently holds third place in the NESCAC in save percentage, at 56.5 percent, in addition to goals-against-average, at 9.61. Mendelson offered high praise of his netminder and discussed the confidence that Bergman exudes, which has helped the team become more sure of itself when it counts. The sophomore duo of Ghesquiere and Stanton commenced the game’s scoring for an early 2-0 lead, but Williams soon fired back with two goals of its own. Stanton would then add another, followed by a goal by Hawthorne before the Ephs answered with two more goals, and the teams ended the first quarter in a 4-4 tie. When Williams quickly went up by two at the start of the second quarter, Stanton and Hawthorne answered the bell, soon knotting the score at six goals apiece. Two more Williams goals were quickly countered by scores from Hawthorne, Devaney, and DellaFera, adding­ up to a 10-9 Cardinal lead at the half. Collin Hitter ’18 and Hawthorne stretched the Cardinal lead to three goals in the half’s opening moments before the Ephs cut the lead to two at the 12:47 mark of the third quarter. Stanton was able to add two more goals in the quarter, while Williams’ Michael Fahey would score one of his own, sending the teams into the final quarter with a 15-13 Wesleyan advantage. Ghesquiere chipped in two goals in the final frame, and goals by DellaFera and Shively capped the Cardinal scoring for the day. 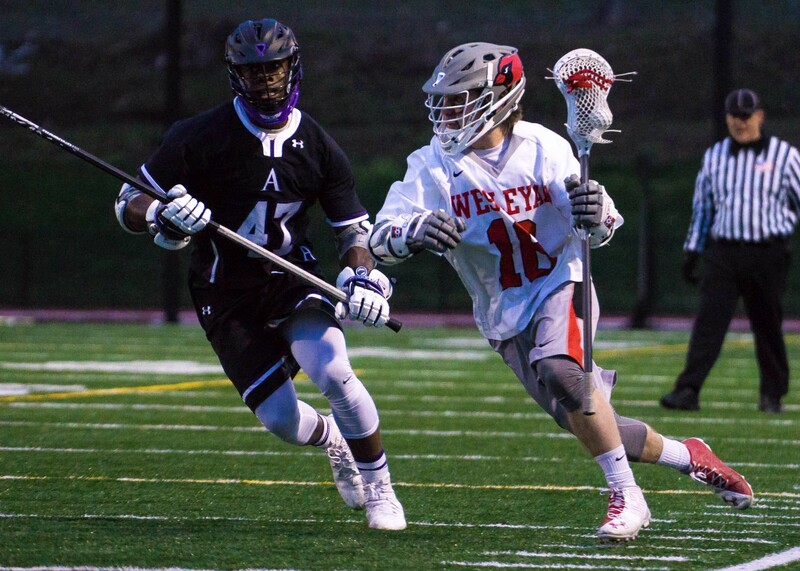 The Ephs were able to match the Redbirds’ four fourth-quarter goals, but it was not enough to overcome the deficit, and Wesleyan held on for the two-goal victory. The importance of Wesleyan coming out on top of a close NESCAC matchup cannot be overstated, especially following the loss to Amherst. Despite the lingering taste of its heartbreaking overtime loss just days earlier, the team was able to execute efficiently and get back on track. Even though the tilt ended in a more positive result, Mendelson said the team did not do anything differently this time around. Finally, in reflecting upon his individual efforts this season, Mendelson instead deferred to the play of his teammates. Mendelson has enjoyed success on defense, including forcing six turnovers in one game two weeks ago. The squad hopes that the synergy on defense will continue when the team returns to action this Tuesday. The Cardinals will travel just up the road to Hartford and take on the Trinity Bantams at 4 p.m.